New Atari 800 laptop. Click here for super-sized, printable version. 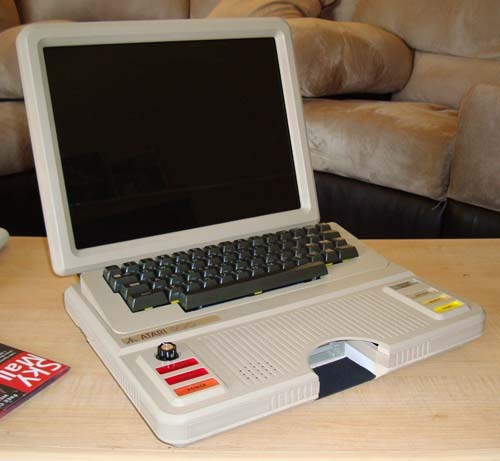 For many years an Atari 800 laptop was my “dream project”. It was the computer I grew up with and thus I have fond memories of it. Finally in 2006 I completed one. You can see it here. A few years later I did another by request. These were all well and good, but I didn’t feel I properly captured the spirit of the old machines. Earlier this year I finished the long-gestating Commodore 64 laptop. It turned out great, and looked properly old. This left me conflicted however – I wasn’t a Commodore guy, but I had done a much better job on it than my beloved 800’s. This year that all changed! 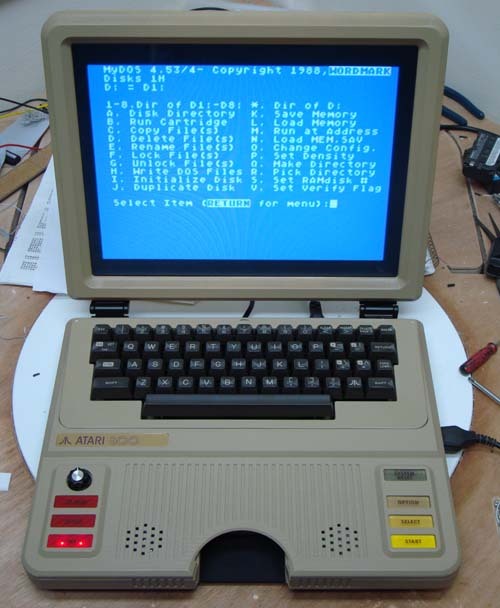 Someone requested I build them an Atari 800 laptop, and I decided to go full out and not only beat my own C64, but make it perhaps my coolest project ever. Riveting DOS action. Click here for super-sized, printable version. Base unit is Atari XEGS motherboard, as usual. XE 130 RAM expansion built-in. Uses MyIDE circuitry and custom OS ROM to use a 2.5″ PATA hard drive. Very fast! You can check out Mr Atari’s site here. To see more pictures and read the Making Of, click below. My next project shouldn’t come as a surprise… in fact, chances are SLIM you won’t be able to guess.